Studio picture of the Aquada aqua car from Gibbs Technologies, Ltd. Imagine taking this aqua-car up to Lake Geneva or over to the Chicago Air and Water Show at Lake Michigan. Strange news on a day when Chrysler is fighting for its life: the new company bringing amphibian technology to practical use and founded by New Zealand entrepreneur Alan Gibbs is known as Gibbs Technology and has a plant in Auburn Hills, Michigan. The company currently plans to introduce three high-speed amphibians (HSA) in the United States during the next three years, including an all-terrain-type vehicle, a sporty car and a larger sport-utility vehicle. The Aquada is expected to be rolled out or main production in 2009. 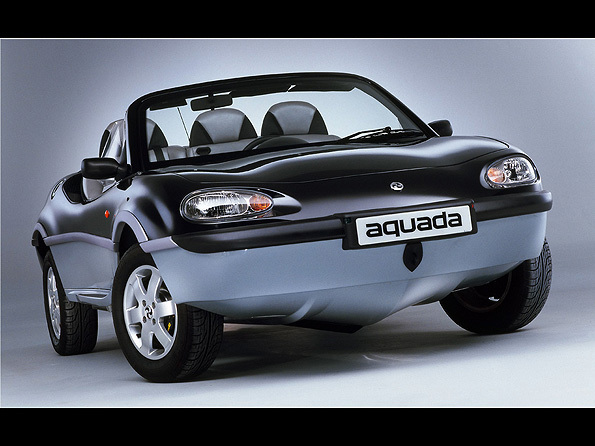 Aquada, a vehicle that combines the handling of a sports car with an ability to travel at land speeds in excess of 100 mph. No slouch on water either, the Aquada broke the previous 9 mph amphibious vehicle speed record by a long shot, clocked at 32.8 mph, driven by Sir Richard Branson (owner of Virgin Atlantic Airways) in 2003. While prototypes sold for $270,000 in Europe, U.S. prices are expected to be $80,000 to $90,000 when the Aquada goes into production.